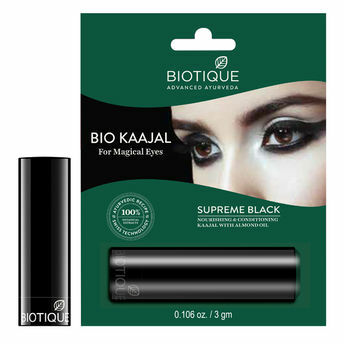 This soothing eye liner is made in the traditional Ayurvedic manner, blended with pure Sesame oil, sweet Almond oil and extracts of Eclipta alba, Indian Gooseberry and Berberis Aristata. Nourishes the eye, area and leaves eyes sparkling. Also promotes eyelash growth. Almonds are the earliest and most nutritious of the entire world's nut crops, rich in soothing Vitamin E and other antioxidants known to improve and protect the complexion. Useful in treating eczema, pimples and blackheads. Explore the entire range of Eyeliner available on Nykaa. Shop more Biotique products here.You can browse through the complete world of Biotique Eyeliner .